The posts in my home building series are filled with lots of words and as much as I love to read, sometimes I also just like to look through photos! And if that speaks to you too, you’re going to love this post! I thought it would be fun to look back at our kitchen being built from start to “finish”. I put finish in quotes, because we still have a few finishing touches to add to call it complete! I also included all the good details on our selections for cabinets, countertops, backsplash, lighting and appliances at the end of the post! Enjoy!! Watching your dream home being built is a remarkable process! Now let’s get to the details! Our cabinets from Schumacher are Level 2, Spring Valley Maple Square painted Cotton. Each cabinet has satin nickel round knobs (you can mix and match styles of hardware if you’d like, maybe one style on cabinets and another on drawers) I’m so happy with the white color, they’ve been staying nice so far and are easy to clean! We decided to make a last minute upgrade to our countertops during our pre-construction meeting when comparing the options side by side one last time. There really is a significant difference between the Level 2 and Level 3 options and countertops were not something we wanted to worry about replacing later. The one we chose is quartz and the color is Eternal Calacatta Gold. With white cabinets and a light countertop, our subway tile backsplash adds the perfect amount of contrast in the middle! The subway tile is a Level 2 (size 4×12), the color is Modern Dimensions Desert Gray and the grout color is Frost. A quick note before we jump into appliances: look (or wait) for sales and research price match opportunities!! I did not buy a single appliance at full price! Is it impossible to shop for appliances or what? Too many reviews – some are great, some are terrible. So to make fridge shopping easy, I ordered the same one my parents have 🙂 I’ve been really happy with it! The only thing you have to watch is the crisper drawers can get very cold. I’m talking I’ve had carrots freeze in there! I made a few small adjustments and switched around how I store a few things and it’s been totally fine! It’s quiet and works well! Find it here! I love our oven/microwave combo! It looks so nice in the wall and has worked perfectly! The microwave also doubles as a convectional oven; however, I haven’t used it for that yet. This type of unit will cost you a bit of money. I didn’t realize just how much until I started shopping for it and already had the kitchen cabinetry cut out, but I’ll tell you it’s worth every penny and I expect it to last a while! We bought this one! Y’all! this is the quietest dishwasher I’ve ever had!! Allen actually opened it the other day while it was running; it’s that quiet! That also leads to one of my two pet peeves though…it doesn’t lock when it’s running?? I need to look into this. Second, it dries the dishes very well, but the dishwasher walls themselves stay wet. Does this make sense? I don’t know, but it’s so lovely in every other way that I’m going to do a little research on these two items and continue to recommend it. I even ran it during our family get together this past Saturday and nobody knew! I wasn’t sure about a black cooktop on our white counters surrounded by stainless steel appliances, but it looks beautiful! It’s been working perfectly since day one and is easy to clean with the appropriate cooktop cleaner! We bought this one! Lastly, this basket is my favorite piece of decor in the kitchen! Granted, I don’t have much more #lessismore. 🙂 Naturally, it’s from Magnolia Market as is the dish towel. This is a large basket, but it was perfect for our oversized island. 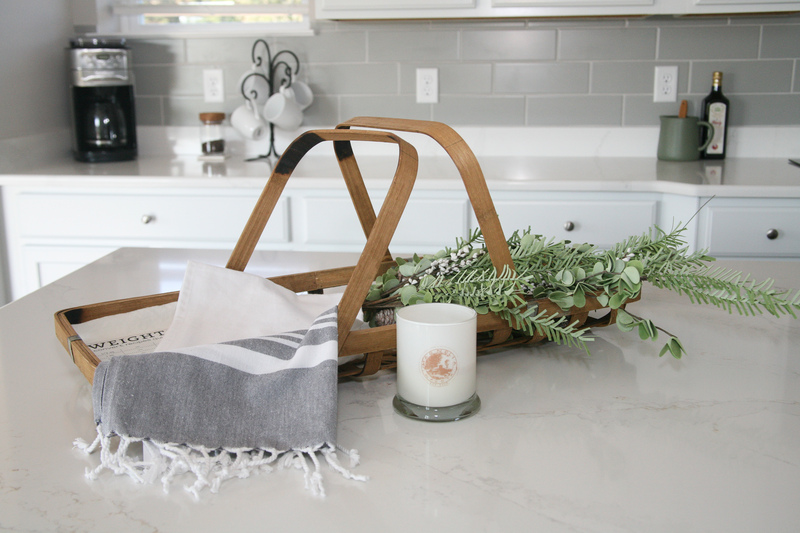 Find the basket here ;the dish towel must be hiding somewhere on their website, because I can’t seem to locate it right this minute! Luckily, they have plenty to choose from so I say have fun shopping around! Questions? Leave me a note in the comments! Hope this post was fun and helpful!! This entry was posted in Design Your Dream Home, New Home Build, Uncategorized and tagged appliance reviews, building with schumacher homes, construction, custom build, decorating your kitchen, designing a kitchen, dream kitchen, how to choose kitchen cabinets, how to choose kitchen countertops, kitchen appliances, kitchen island decor, kitchen lighting, new build, new home, schumacher homes, tips for kitchen design. Bookmark the permalink.